Horse Conformation as a Whole: Can He Do the Job? Importance of well-balanced conformation in the horse. In general, certain guidelines are appropriate and helpful when selecting a future athlete or champion and one of the biggest questions is: Can he do the job? Most outstanding athletes are well-balanced in their overall conformation. This means that the depth of body (from withers to underline at the girth) and length of front legs are similar, the back is neither too long nor too short compared with length of leg, and the underline is longer than the topline. 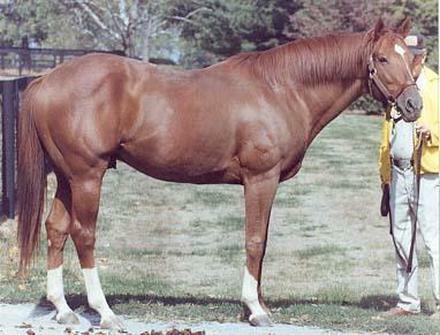 Secretariat's overall proportions by measurement were considered to be excellent by many, and he was considered to have close to the ideal limb/body and length/height ratios. In the young horse that has not yet reached his mature height, however, the front legs will be longer than the depth of body because his withers have not yet attained full height. Regardless of the age of the horse, the angles of the body will not change, and these can be judged whether the horse is a weanling, yearling or adult. For optimum athletic ability, the angles in the body (shoulders, hips, pasterns) should all match, and should be of good length and slope for maximum shock absorption and a good stride. No matter what size he is, the horse should have good balance and all his parts fit together. If he is well proportioned and his shoulder angle matches that of his hip, with good over-all conformation, he will probably be a good athlete--with speed and agility--whether he is large or small. The angle of the hip, rather than the horse's size, length of leg, or height, is what governs his stride. A horse with a long, well-sloped shoulder and long hip will usually be fast and agile and move with a minimum of effort, compared with a horse that has a short, steep shoulder and hip, with choppy action. A horse with a long, well-sloped shoulder and long hip will usually be fast and agile and move with a minimum of effort, plus a sloping shoulder has better shock-absorption and provides a comfortable ride. A well laid back shoulder (acute angle between shoulder blade and the line drawn from point of shoulder to elbow) permits a greater swing of leg; the horse can reach out farther with his front feet, with a longer stride. In the hindquarters, too, the sharper the angle and the greater the length of hip, the greater will be the freedom of movement in the legs. A well-proportioned horse has a short top line and longer underline. The adult horse should be square, with the length of his body (point of shoulder to point of buttocks) equal to his height at the withers. 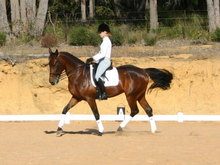 Legs and body are also equal; the well-balanced horse is the same distance through his body (top of withers to underline) as he is from underline to fetlock joint. Most young horses are taller at the croup, until the spinal processes of vertebrae at the withers have completed their growth, as have the bones of the forelegs. By the time the horse stops growing and has reached full mature height, the withers will be level with (or sometimes slightly higher than) the croup. In some horses, however, the horse finishes his growth and remains taller at the croup. When riding this type of horse, your saddle is always sliding forward. It tends to go too far onto the shoulders, which not only hinders shoulder movement but may cause pressure and chaffing sores on withers and girth. Body balance of the horse is partly determined by the relative height of croup and withers, but also by the position of the backbone from front to back--how low or high the base of the neck is, and where the neck vertebrae join the thoracic vertebrae. To keep the saddle from going onto the neck when traveling down a steep hill (or if the horse bucks--which the discomfort from a too-far forward saddle may cause him to do), the rider must have the cinch uncomfortably tight. Some riders on a horse with this kind of build use a breeching to hold the saddle in place, or even a crupper (strap that goes back to the tail and is anchored under the dock of the tail). This is not very comfortable for the horse. A high croup and low withers can be a big disadvantage to athletic ability in a riding horse. When the croup is higher than the withers, the horse's weight is concentrated more onto the front legs, which reduces his front-end agility, especially when the horse is asked to collect himself, jump or make quick changes of direction. The horse must work harder at lifting his forehand, and many of his muscles (especially in his back, loins and front legs) become easily fatigued. The downhill balance also puts more concussion impact on the front legs. This can lead to injury and breakdown, as well as being jarring to the rider. Some horses have withers higher than the croup after they finish growing. Too-high withers makes the saddle tend to slide back toward the loins, putting the rider too far back on the horse. It is more difficult for the rider to maintain proper balance and position, and the rider's weight this far back also interferes with the horse's balance when doing active maneuvers. If the girth or cinch moves back a few inches, it may inhibit expansion of the ribcage for adequate breathing room if the horse must exert. A breast collar will be needed to keep the saddle in place. If the saddle slips back, it puts the rider's weight over the loins, where the back is least designed to carry it, and more weight on the hindquarters. This may add strain to joints and ligaments of the hind legs if the rider is very heavy. This hookup helps determine whether the horse will be heavy in front, and how he moves. A front-heavy horse with downhill balance is often best at straight-ahead activities such as racing, and not so good at actions that require collection and lightness, or stops and turns. Body balance--comparing front and hind ends of the horse--is often assessed by looking at the height of withers and croup (whether they are the same level or one is higher than the other) but this is not always a true indication of the actual balance of the horse. Sometimes a horse with withers and croup the same height is still built uphill or downhill. The most accurate way to determine the balance is to look at the vertebral column and whether it is level--or how much it slants from front to back. His front legs should be straight when viewed from the side or front/back and his hind legs should be straight when viewed from the back and without excessive angle (sickle hocks) or not enough angle (post legged) when viewed from the side. The better the horse's feet and legs, the longer he will hold up, and although most horses are not perfectly straight in the legs, some types of deviation are less harmful than others. If there is any deviation from straight, being slightly cowhocked in at the hocks) is always stronger construction than being out at the hocks. A horse that's bowlegged at the hocks will rarely hold up and stay sound with hard work. Hock joints get a lot of stress in the western performance horse (stopping from speed, pivoting on the hind legs, etc.) and they must be well constructed with proper angles to avoid damage from strain and stress. Leg action should be free-flowing and fairly straight. The horse with crooked legs and crooked flight path of the feet puts more strain on all leg structures, and when working at speed he may strike himself and injure his legs. Any horse that is out of alignment with much deviation from straight foot flight tends to have problems at fast gaits. 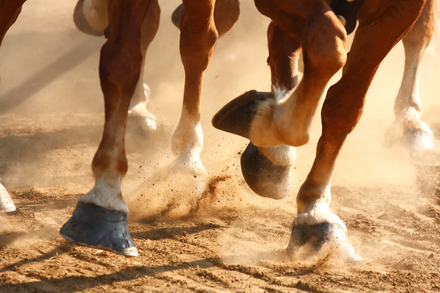 The horses with more correct feet and leg structure tend to handle the stresses of athletic exertions with less injury. The better the horse's feet and legs, the longer he will hold up. Most horses are not perfectly straight in the legs, but some types of deviation are less harmful than others. You can often get by with a less than perfect horse if he has strong leg construction and strong joints, along with a good engine--the willpower and endurance (the horseman often calls it "heart") to be a good athlete in spite of minor imperfections. Can he do the job required? Any well-built horse can do nearly any job reasonably well. If a horse is well balanced with good body proportions, proper angles and straight, sound legs, he can be a good all-around horse. The characteristics discussed in previous articles give guidelines for selecting a horse that will be a good all purpose athlete. A horse must be judged not only for correctness of his individual parts, but also for overall balance and symmetry--how well all of his parts fit together. The horse (of any light breed) that has an average length of neck, relatively short back, long and well sloped shoulder, good withers, fairly level rump with long quarters, deep heart girth and flank, good straight legs with proper hind leg angles, reasonable body proportions and balance, will usually be an athlete that can excel at any job. When choosing a horse, breed specialties and faults must be taken into consideration, especially if you want a horse for a certain purpose that is not in his job description for his breed. There are outstanding all-around athletes in almost every light horse breed. Certain breed traits, however, may hinder many individuals within that breed in accomplishing activities that are far removed from their specialty. 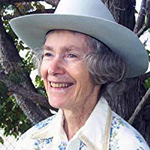 Gaited horses may not make good racehorses or cutting horses, and some of the heavier muscled stock horses won't make good endurance horses, for instance. Some breeds tend to have faults or conformational traits that hinder their usefulness in certain areas. Most breeds have been selectively bred for certain desired traits and specialties that might hinder their ability to do other things. When choosing a horse, these specialties and faults must be taken into consideration, especially if you want a horse for a certain purpose that is not in his job description for his breed. For instance, it may take longer to find a horse within that breed that does not have a certain breed trait that might be considered a fault in a different breed or specialized career (or has it to a lesser degree--that will not hinder the horse in the career you wish for him). If you are trying to find an American Saddlebred to do cattle work or a Quarter Horse to do dressage or gaited classes, you will probably have to look a little harder than if you select from a breed that has been bred for these kinds of activities. Some breeds have structural traits that are not ideal but have been accepted or tolerated in that breed. Some Quarter Horses and Arabians have low withers, for instance, and it can be harder to keep a saddle in place. Some Arabians have quarters and shoulders too short for speed; some are cow-hocked. Some Thoroughbreds are shallow in the flank, and many have low heels, insufficient bone and weaker hoofs (for their size) than an Arabian. Thoroughbreds tend to have thinner hoof walls (and less durable feet) than Standardbreds, even though both breeds are race horses. 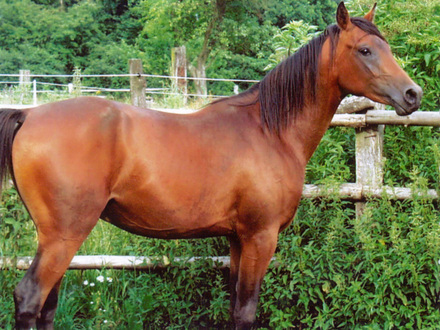 Some Quarter Horses are too heavily muscled for anything but halter class shows or activities involving short bursts of speed, and many are sickle hocked or post legged. Some have feet too small for the weight of their bulky bodies. Some Saddlebreds have pasterns too upright and some are calf kneed. Some Tennessee Walkers have too much slope to the quarters and some are sickle hocked. 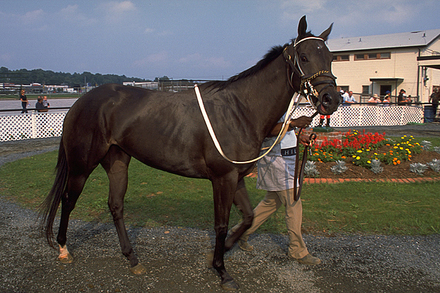 Though each breed has pluses and minuses for certain kinds of activity you can usually find individuals within the breed that have good general conformation for all around athleticism such as this Thoroughbred who is best for pleasuring riding, equitation, and dressage as opposed to racing. The Standardbred may be short in the quarters and long in the back. The Morgan comes in two types--the stocky, compact original type and the taller, leaner Saddlebred type. The compact Morgan is often heavy-crested, an easy keeper, and prone to grass founder. Other breeds have their own digressions from basic good conformation and usefulness, due to the goal of creating horses for specific purposes. Conformational features of one breed may not be wanted in another. Yet the basic general balance and conformation of a good riding horse (one that can do many things well) always remain the same, and should be considered when breeding or selecting horses. Though each breed has pluses and minuses for certain kinds of activity (due to selective breeding toward specific goals while ignoring others), you can usually find individuals within the breed that have good general conformation for all around athleticism. Warmbloods that fail at jumping or dressage, etc. If you have a favorite breed and are choosing a horse from within its ranks, you must still be very selective and pay close attention to conformation. Since these horses have been bred for so many different purposes, we see many types of horses today. 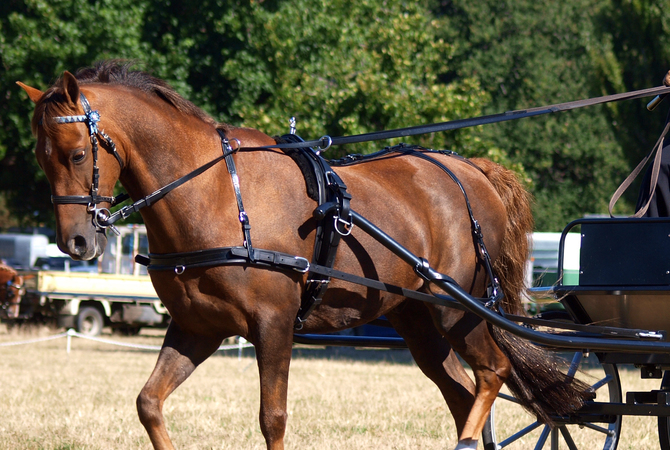 Looking at this situation from extremes, it is easy to see that a racehorse could not do well pulling a plow (he doesn't have proper leverage nor power, and his shoulders are too narrow for pulling loads) and a draft horse doesn't have the streamlined body or muscle/bone structure and angles for long distance speed. If you have a specialized job in mind for a horse, you'll want to select one from the ranks of specialists that do that particular job very well. This is the fifth in a series of five articles that are written by the author of "The Horse Conformation Handbook ." This book, illustrated by Jo Rissanan (a frequent EquiMed contributor), is a must read for anyone interested in a detailed understanding of horse conformation.